We have carved a niche amongst the most trusted names in this business, engaged in offering comprehensive range of Water Based Sealer. 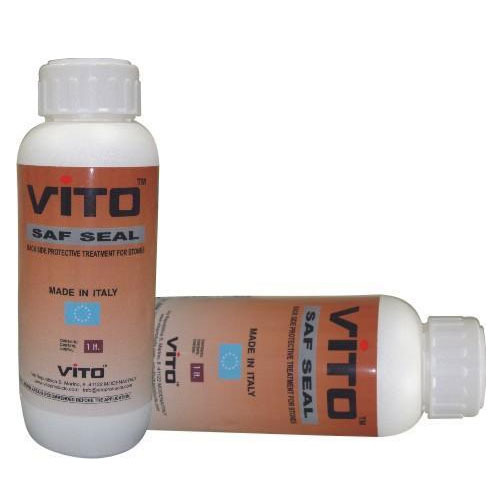 Description : VITO SAF Seal is a water based sealer, a water repellent emulsion with acrylic reactive resins for back side protection in stones. Application : Apply undiluted SAF SEAL back side of stone by paint brush, allow it to dry for 2-3 hours and continue with stone fitting. Advantage : The product forms a film with very powerful chemical and mechanical properties. It can be used before the laying, for treatment of back of slabs and tiles. Suitable : For marbles, granites, artificial stones & vitrified tiles. Established in the year 2003, Stone Tools And Chemicals Pvt Ltd has carved a niche amongst the most dominant names in the market. The head quarter of our corporation is located at Bengaluru, Karnataka (India). We are a most trusted name among the topmost companies in this business, involved in manufacturing of Marble Sealant, Stone Sealant, Polishing Powder, Adhesive Chemical and many more. These products are highly appreciated for their quality. Furthermore, we also provide Epoxy Grouting Service, Marble Polishing Service and Marble Installation Service.